At Jenny K Restaurant, we pride ourselves on providing our customers with mouth-watering Chinese delicacies. Serving the same location in Estevan for 15 years, we offer a wide array of delicious recipes including chow mein, rice noodles, fried rice, as well as a variety of beef, chicken and seafood preparations. Our ginger beef and wor wonton soup are the best, and they will have you coming back for seconds. Winner of the 2010 Top 100 Chinese Restaurant Awards, our restaurant is open 7 days a week. We prepare all our dishes with love, and we constantly strive to make our menu the perfect accompaniment to engaging conversations with friends and family. We offer everything from traditional favourites to deep-fried chicken wings. We stand behind our commitment to serve top-quality Chinese food to our customers. Whether you're out for a filling lunch or a savoury dinner, our flavourful dishes, coupled with our excellent service, won't disappoint you. 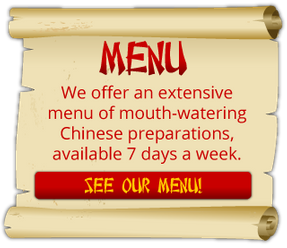 Call us for delivery or stop by our restaurant for a scrumptious Chinese meal. We close at 9:00 PM on holidays.